Payments for the 2015 Agricultural Risk Coverage at the county level (ARC-CO) program will be made this fall, providing much-needed funds for many farms with short cash flows. At this point, not all data needed to calculate ARC-CO payments are known with certainty; however, reasonable estimates of payments can be made at this time. 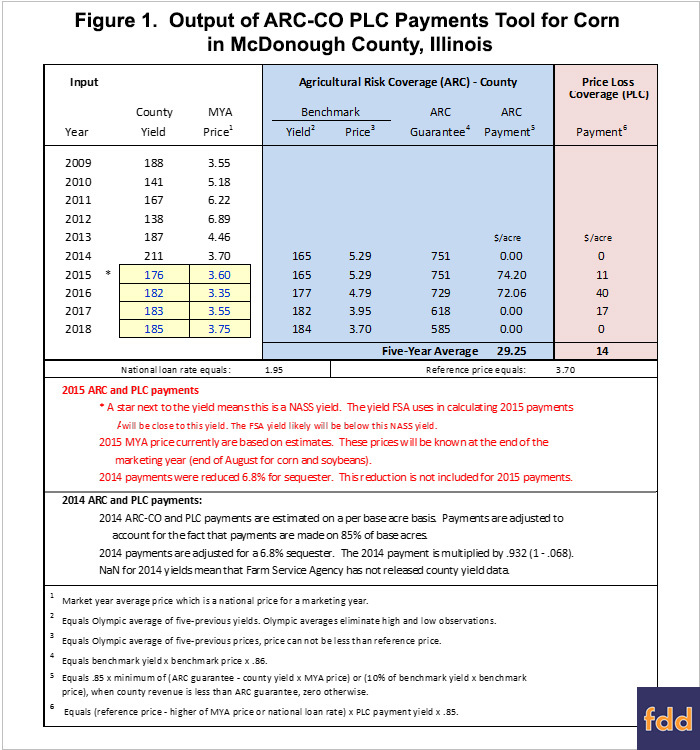 In this article, ARC-CO payments are shown for corn and soybeans in Illinois counties. Maps showing corn and soybean level of payments across the United States also are provided. As indicated in the final commentary section, farmers and land owners should not expect as large of ARC-CO payments for 2016, unless 2016 revenues are below 2015 revenues. ARC-CO is one of three choices that farmers and landowners had for receiving commodity title payments under the 2014 Farm Bill. These choices were one-time decisions, made for each program crop on a Farm Service Agency (FSA) farm, with the decisions being unchangeable for the length of the 2014 Farm Bill, scheduled to end with the 2018 production year. 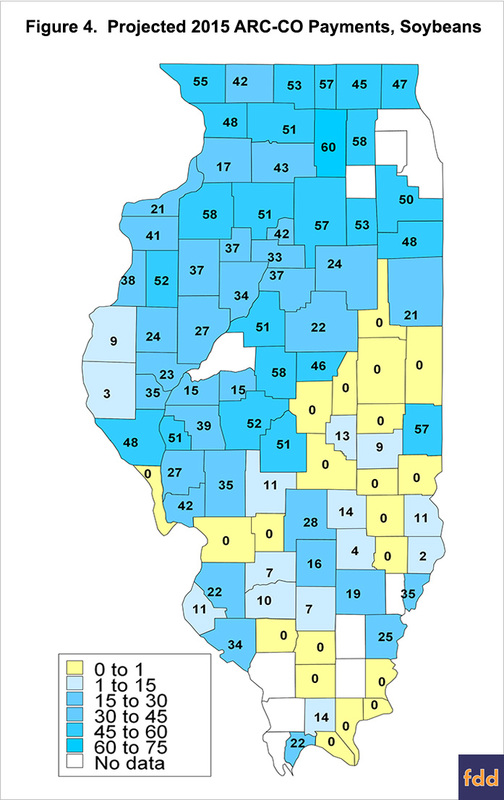 For corn and soybeans, over 90% of the base acre were enrolled in ARC-CO (farmdoc daily June 16, 2015). Market Year Average (MYA) prices. ARC-CO uses national, MYA prices in the calculation of revenue. The marketing year for corn and soybeans begins in September and ends in August, so the end of the marketing year has not been reached; however, the range of possible 2015 MYA prices is fairly narrow. In its May report, World Agricultural Supply and Demand Estimates (WASDE) report puts the MYA price mid-points at $3.60 per bushel for corn and $8.85 per bushel for soybeans. It is very likely that the final MYA price will be within $.10 of these midpoints. If a bias exists, the mid-point price may be too low should price increases persist for the last six weeks of the summer. County yields. FSA will release their estimates of county yields this fall before making ARC-CO payments. In this article, county yields released by the National Agricultural Statistical Service (NASS) will be used to estimate 2015 ARC-CO payments. NASS yields will not be the same as FSA yields. Where NASS data exists, FSA yields generally will be below the NASS yield. Where NASS data does not exist, 2015 ARC-CO estimates are not made. Federal Budget Sequester amount. Last year, commodity payments under the 2014 Farm Bill were reduced 6.8% due to sequester requirement contained in Congressional budgeting processes. A sequester likely will occur for 2015 payments. In this article, a sequester reduction is not included in payment estimates. Payments shown in the following maps were estimated using the same procedures as used in the ARC-CO PLC Payment Estimator, a Microsoft Excel spreadsheet available for download in the FAST section of farmdoc (click here for download). Default values for each county and crop will produce the values contained in the maps. Figure 1 shows output from the tool for corn in McDonough County, Illinois. The estimated 2016 ARC-CO payment is $74.20 per base acre, as shown on the 2015 line of the output. Footnotes in the table detail ARC-CO payment calculation. Note that the 2016 guarantee will be lower than the 2015 guarantee. The reduction in the 2016 guarantee occurs because it is based on a 5 year Olympic moving average of county yield and U.S. crop year prices. In particular, the higher price year of 2010 was in the guarantee calculation for the 2015 but not the 2016 crop year. This will have the impact of reducing 2016 ARC-CO payments unless either prices or yields are lower than 2015 levels. The 2016 estimate of $72.06 per acre is based on a lower MYA price of $3.35, the current midpoint of the 2016 WASDE range. Figure 2 provides 2015 ARC-CO payments estimates per base acre for corn. 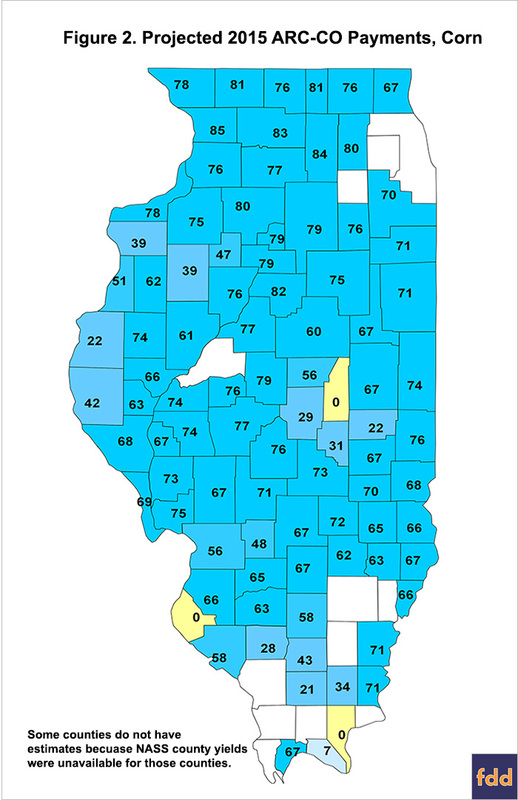 Many counties in northern Illinois have projected payments in the $70 to $80 per acre range. Payments tend to decrease the further south in Illinois, due to higher relative yields in the central and southern portions of the state. Most southern Illinois counties have payments projected in the $50 to $60 per base acre. Three Illinois counties have projected payments of $0: Monroe, Piatt, and Pope. County yields in these counties were well above average. Some counties in Figure 2 are left blank. In these counties, NASS did not provide a yield estimate that matched FSA yield definitions for calculating ARC-CO payments. For example, Mason County — the irregularly shaped county in the middle of the state — does not have a 2015 ARC-CO payment estimate. In this county, NASS provides an “all” acre estimate while FSA makes payments on irrigated and non-irrigated acres. As a result of yield definitions not matching, a 2015 payment estimate is not given. For the remainder of counties in Illinois without ARC-CO payment estimates, NASS did not provide 2015 yield estimates. 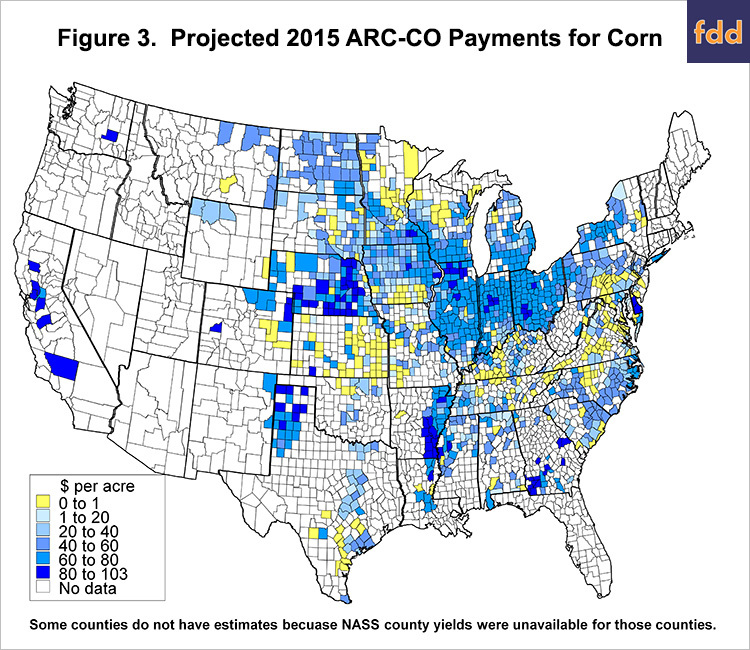 Figure 3 shows a color-coded map of 2015 ARC-CO estimated payments for corn across the United States. Where irrigated and non-irrigated payments estimates exist, the irrigated ARC-CO payment estimated is shown in Figure 3. Counties left blank do not have a NASS yield estimate. As can be seen in Figure 3, many counties in the United States will receive 2015 payments. In general, counties with higher relative yields will receive lower payments and vice versa. For soybeans, 2015 ARC-CO payments are projected to be $50 to $60 per base acre in Illinois (see Figure 4). As with corn, payments generally decrease for central and southern counties, with a significant number of Illinois counties having projected payments of $0 per base acre, due to their high yield for the 2015 crop relative to the Olympic average yield for the 2010 through 2014 crop years. Figure 5 shows a map of estimated 2015 soybean payments. Many counties are projected to receive payments. Within the corn-belt, payments are made in most counties in a band beginning in eastern Iowa, crossing northern Illinois and southern Wisconsin, extending across northern and central Indiana, and ending in Ohio. Many counties in northern Iowa and southern Minnesota are projected to not receive payments. ARC-CO is projected to make payments in most North Dakota counties as well. 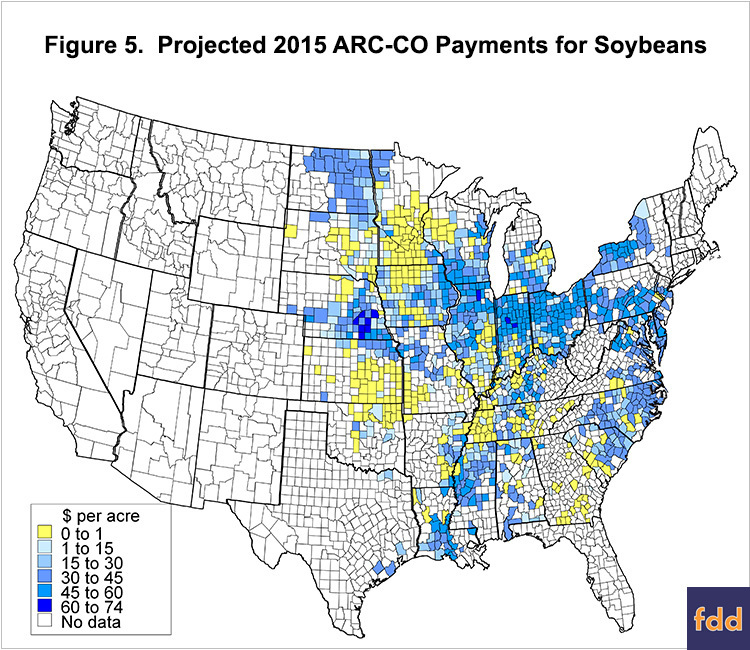 ARC-CO payments for both corn and soybeans are negatively correlated with yields, with counties with higher yields receiving lower ARC-CO payments. Those counties with higher yields also had higher revenues from crop sales. In this sense, ARC-CO targets payments to areas with lower revenue compared to revenue from the county during the five most recent crop years. ARC-CO payments for 2015 will be a significant positive cash flow on many grain farms as net farm incomes are projected to be low in 2016 (farmdoc daily April 26, 2016). However, these payments will not completely offset the lower prices and the remaining, stubbornly high costs that contribute to negative cash flows. Unless prices increase in the near future, an urgent need to cut cash flows now and through 2017 will exist. Farmers and landowners should not expect the same level of ARC-CO payments for the 2016 production year, which will be received in the fall of 2017, unless prices go to lower levels than are currently being experienced. Moreover, even lower payments should be expected for the 2017 and 2018 productions years. ARC-CO design causes its support to decline over time if low prices continue indefinitely. As a result, ARC-CO provides a bridge for making adjustments and lowering costs. ARC-CO will not provide continuing support year-after-year. Coppess, J., and N. Paulson. "Agriculture Risk Coverage and Price Loss Coverage in the 2014 Farm Bill." farmdoc daily (4):32, Department of Agricultural and Consumer Economics, University of Illinois at Urbana-Champaign, February 20, 2014. Schnitkey, G. "2016 Net Farm Income Projections Under Different Price Scenarios." farmdoc daily (6):80, Department of Agricultural and Consumer Economics, University of Illinois at Urbana-Champaign, April 26, 2016. Schnitkey, G., J. Coppess, N. Paulson, and C. Zulauf. "Perspectives on Commodity Program Choices under the 2014 Farm Bill." farmdoc daily (5):111, Department of Agricultural and Consumer Economics, University of Illinois at Urbana-Champaign, June 16, 2015.